Crispy, moist and delicious, our version of this comfort food will bring you back home. 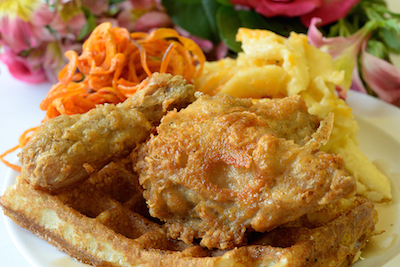 We add a hint of honey in the batter and spice the chicken just right. Served with tangy Apple Fennel coleslaw and REAL Tater Tots. 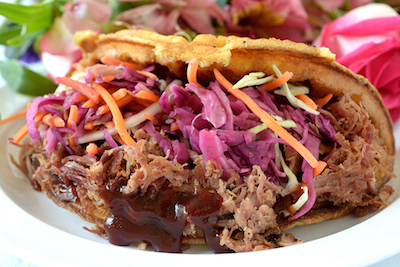 Smokey and robust, this pulled pork is braised with our special spice combination, and served in a cornbread waffle. Topped with Sweet Baby Ray’s BBQ sauce and our crunchy Apple Fennel slaw. 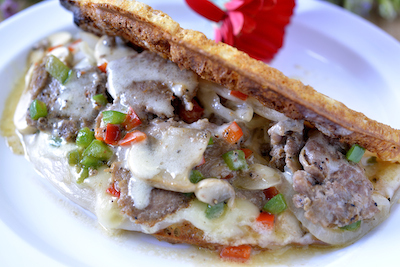 This hearty Philly cheesesteak will satisfy your hunger! 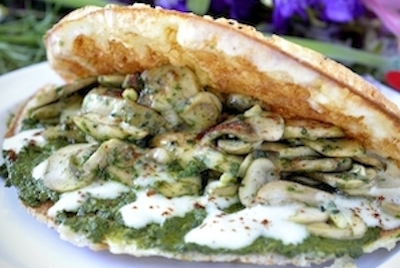 Built with caramelized onions, freshly sauteed mushrooms, and bell peppers, topped with our thick, provolone cheese sauce in a waffle sandwich. 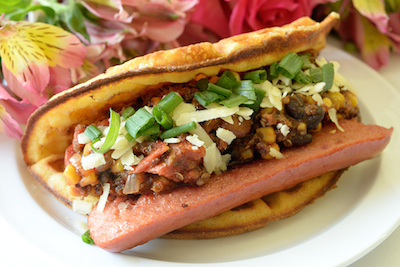 This classic All American combination never tasted better than when served as a cornbread waffle sandwich! All beef, Hebrew National hot dog, slathered in our homemade chili, topped with grated cheddar, and onions takes you home. Who doesn’t LOVE bacon? 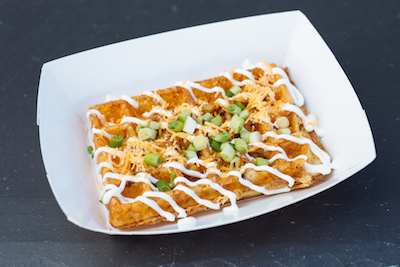 This delicious combination of hand-grated, extra sharp cheddar cheese and Thick-cut Applewood smoked bacon baked into the waffle, is topped with our Mornay sauce and scallions. Sink into this twist on a classic! 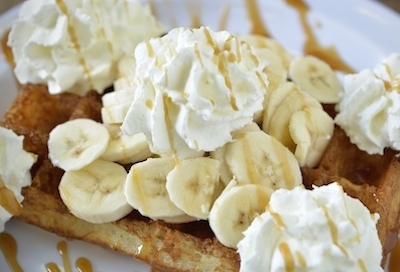 With our Salted Caramel Rum sauce, a sliced banana, fresh whipped cream and more sauce drizzled on top, you’ll savor this divine treat. 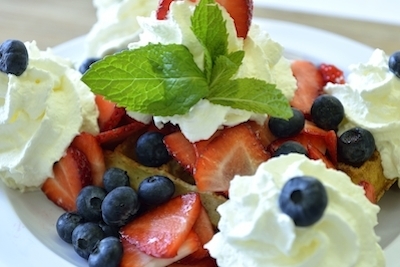 A fruit lovers dream, this waffle is abundant with fruit – blueberries, sliced strawberries and generous fresh whipped cream! 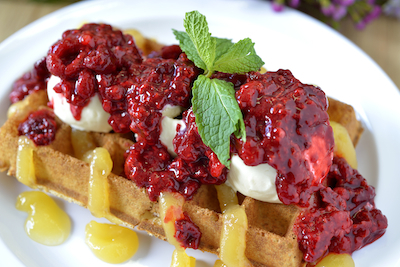 Our personal favorite, this sweet and tangy waffle is made with Lemon curd, Treats Vanilla ice cream, and blanketed with our Raspberry sauce and a bit of fresh mint. 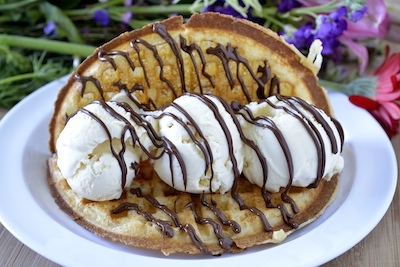 Get creative by building your own waffle! Available toppings are: Syrup, clarified butter, bananas, strawberries, blueberries, fresh whipped cream, Belgian hot fudge, Reese’s peanut butter sauce, Nutella, and our Salted Caramel Rum sauce. 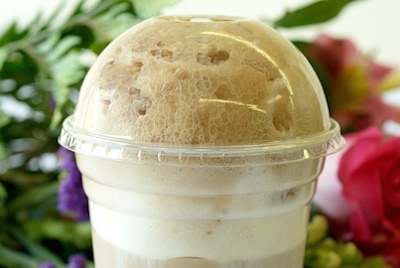 Classic, sweet and refreshing, our Root Beer float is a must have! Two large scoops of Treats Vanilla ice cream swim in 12 oz. of root beer for a creamy, cool dessert drink. We tailor our menu to the season, the time of day, and the venue. Not all menu items are available at every event. We welcome requests for specific items, and are happy to accommodate them if at all possible. Coming soon……a new “Drop Off” catering menu! Check out our future events (and even suggest an event!) by visiting our calendar page! Get recipes and our tips delivered directly to your inbox! We are proud to offer a 20% Military Discount for Active Duty and Spouses of Active Duty Personnel! 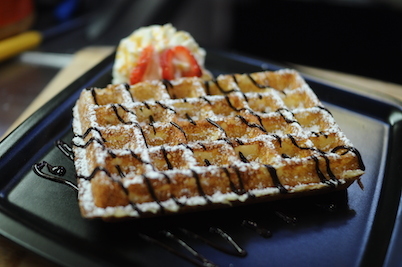 Copyright ©2016 - 2019 Waffle Amore. All Rights Reserved.